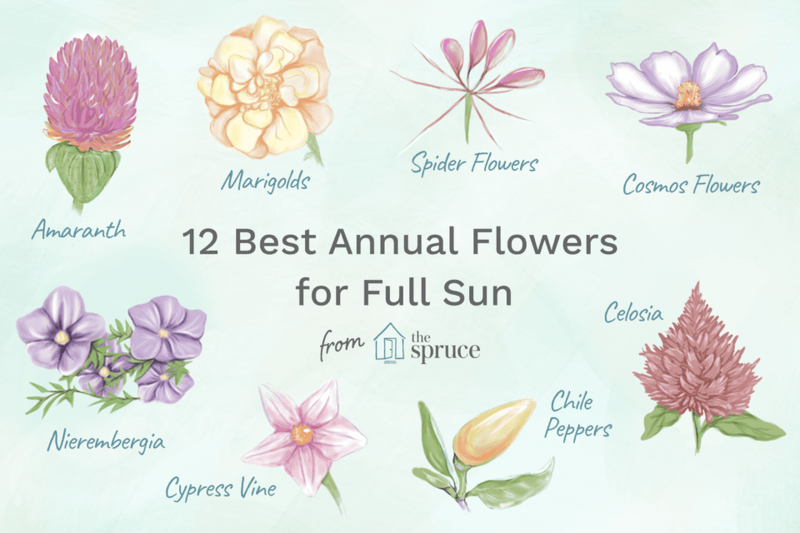 If you have a sunny spot in your yard that looks perfect for a flower garden, make sure you choose plants that can thrive in the hot sun without a lot of extra care. This can be a bit tricky if you want to grow annual flowers in full sun. It gets pretty hot sitting in full sun all day. Some plants love it, others faint. Humidity can add to the oppressiveness of hot days, but even dry heat can be uncomfortable when the temperatures top 90 F. People have air conditioning to escape to, but plants have to learn to adapt. Perennials with deep tap roots and water-conserving leaves handle the heat of full sun well enough, but annuals never have a chance to develop an extensive root system, and they already expend a lot of energy growing rapidly and flowering profusely. You have to choose wisely to find annual flowers that can stand up to extremely hot weather. With dry heat, a little afternoon shade and a good layer of mulch, you can help sustain many plants, but you do not want to be faced with constant watering. In areas with high humidity, there are a host of additional problems you need to think about, especially if the heat and humidity persist through the night. These stressed plants are sitting ducks for insect pests and fungal diseases. The following 12 plants can stand up to heat and humidity. You will want to get them established before the worst of the heat sets in, and you will still need to keep them watered regularly. They will not faint during the day or require a lot of additional care. There are many varieties of amaranth. Some are grown strictly as flowers, some for their leaves, and others for use as a grain. Amaranth is the most widely grown grain in the world. 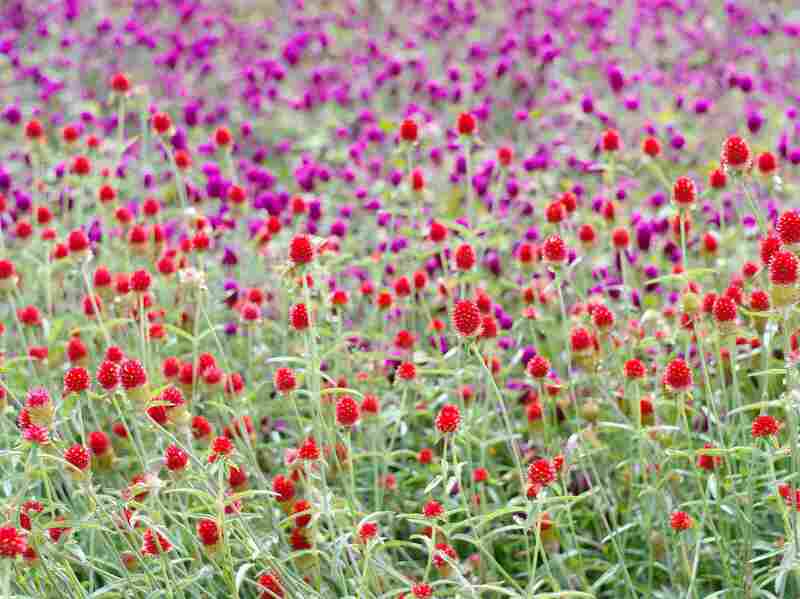 Gardeners love them for their chenille-like blooms and colorful foliage. Love-lies-bleeding (Amaranthus caudatus), with its long, dangling, mauve-pink flowers, and Joseph's Coat (Amaranthus tricolor), with splashy red and yellow leaves, are two varieties you may be familiar with. Amaranth plants can grow from a few inches to 8 feet tall. They all grow well from seed and can handle just about any growing conditions, including being grown indoors as houseplants. As with many of the plants on this list, amaranth is actually a perennial in U.S. Department of Agriculture hardiness zones 10 to 11. The ornamental varieties are often grown as annuals. If you notice a similarity between the flowers of celosia and amaranth, it's because they are both in the same family. The name celosia comes from the Greek word for "burned" because the flower heads of Celosia argentea (Syn. C. plumosa) look like flames. The colors are certainly brilliant. As you might expect from looking at them, these are semi-tropical perennials in USDA hardiness zones 9 to 12. They are often grown as annuals. Cleome's common name is spider flower, for the long "legs" that jut out from the blooms. The plants start flowering from the bottom up, extending the bloom period for weeks. As the flowers fade, long, slender seed pods form. Cleomes are prodigious self-seeders, but because most are hybrids, you never know what colors you will get next year. Seed can be direct sown anytime after your last frost date. These are tall flowers that branch out and generally can support themselves without staking. If you live in USDA hardiness zones 8 to 11, your cleome may turn out to be a short-lived perennial, but anyone can grow them as annuals. Cosmos flowers (Cosmos bipinnatus) are about as easy to grow as it gets. You can find them in rich, bright shades of pink, purple, orange, and red, as well as soft pastels, and even white. The flowers are only about 1 inch across, but they just keep coming. The plants are sturdy and intermingle well with other flowers. This is another eager self-seeder but not to the point of nuisance. Different varieties will grow from 1 to 4 feet tall. Cosmos are easy to start from seed. Direct sow them anytime after your last frost. Cosmos are heat lovers that are perennial in USDA hardiness zones 9 to 11, but they are most often grown as annuals. Since they often self-sow year after year, you may think they are perennial even in your non-tropical garden. Nieremburgia is extremely popular in containers, but it is perfectly at home in the garden and makes a nice edging plant. It has a clumping growth habit and quickly fills out. As with so many of the plants on this list, Nieremburgia is a hardy perennial in USDA hardiness zones 7 to 10, but it is often grown as an annual, and it certainly blooms like one. Tubular, star-shaped red flowers and thin, ferny leaves makes Cypress vine (Ipomoea quamoclit) an ornamental climber. It is in the same family as morning glory and grows just about as quickly, reaching 10 to 15 feet in no time. It does not take as long as morning glories to start blooming, but it will grow tall before it starts setting buds so be patient. You can start them indoors, in peat, or paper pots a few weeks before your last frost date. You can also direct seed outdoors after danger of frost. Be sure to give them something to climb or sprawl over. They will grab hold of other plants, but if you are using a trellis, you will need to help them get started, twisting around it. Cypress vines are hardy perennials in USDA hardiness zones 8 to 11 and even gardeners in zone 7 could have them over-winter in mild seasons, but they grow quickly enough for everyone to be able to grow them as annuals. If you are lucky enough to live in a climate where lantana (Lantana camara) is hardy, you probably have it growing as a shrub. It also trains easily into a standard or small tree. Many gardeners in colder climates do this and overwinter the plants indoors. Lantana flowers are often bi- or tri-colored in wonderful sherbet shades. As with all the plants listed here, they bloom throughout the summer. All parts of this plant are poisonous and can cause skin irritation, so handle with care. In USDA hardiness zones 8 to 11, lantana can be grown as a perennial and can get quite large. You will often find seedlings available in the annuals section. They are so ubiquitous, we do not give marigolds their due. These are extremely tough little workhorses. They do best in full sun with soil left a little on the dry side. If crowded in damp conditions, they can be prone to mildew, but you can avoid that if you give them plenty of air flow. Deadheading will get them blooming repeatedly, but even if you do not bother with it, they will resume blooming soon enough. Another under-rated feature of marigold is their use as companion plants since they are known to repel pests like asparagus beetles, bean beetles, nematodes, and even rabbits. Marigolds are perennial in the warm climates of USDA hardiness zones 9 to 11. Everyone else can grow them as annuals. These are not technically grown for their flowers, but they are just as beautiful. Ornamental peppers are edible chile peppers and most are extremely hot. They are also generally small and difficult to harvest, but someone noticed how beautiful they are and thought to put them in the flower garden. You will need to keep an eye on them, while they are young and tender. Rabbits have been known to chew the stems. Once the stems begin to harden off, they are pretty much safe. Just like the peppers we grow in the vegetable garden, ornamental types go through several different colors as they ripen. Some, like this tri-colored variety, have multiple colors on the plant at any given time. Peppers are tropical perennials and are hardy in USDA hardiness zones 9 through 12, but they are frequently grown as annuals. This might not be what you would expect to see if you planted sunflowers, but tithonia, or Mexican sunflower, is definitely a sun lover. Give it a hot, sunny site and it could easily reach heights of 5 to 8 feet tall. It is definitely a back-of-the-border plant and may need some support or staking, especially in windy sites. You can direct sow seeds, after danger of frost, or start them indoors, four to six weeks before you set them out. Do not rush them. The seedlings can stunt if exposed to cold temperatures. Tithonia is perennial in USDA hardiness zones 8 to 10, but the majority of gardeners grow them as annuals. They grow and bloom quickly. There are several species of verbena that make great garden plants. Most start blooming early in the season and continue on until frost. There are low growing, ground covering verbenas, tall, airy Verbena bonariensis, and upright Verbena rigida, which grows about 3 feet tall. USDA hardiness zones will vary with variety, but they tend to be short-lived as perennials and are usually grown as annuals. Finally, a true annual, zinnias (Zinnia spp.) are native to Mexico and Central America. They truly love heat and bloom so easily, you can use them as a cut flower, and they will simply bloom again in a day or two. Older varieties are prone to powdery mildew in damp or humid weather. It will not stop them from flowering, but it does make the foliage look unattractive. Some of the newer series, like Profusion and Zahara, do not have that problem. This series of flowers tend to be a bit smaller but just as abundant. There is a zinnia color for everyone from peppermint stripes to eye-popping golds to delicate neutrals.